T1- T3= $62.00 These Super Satellite Reception Premium Sites are our absolutely TOP of the Line sites with excellent south west satellite reception! 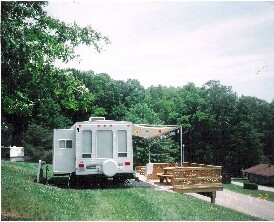 T4= $62.00 This site is a Super Satellite Reception Premium Site that is a pull through with 30/50 amp Electric Service, Water, Sewer, Cable TV, Free WiFi, and an 8' x 12' deck. V3= $62.00 This site is our best site with 50/100 amp electric service to handle the most demanding needs, plus Water, Sewer, Cable TV, and Free WiFi. It also has a 12' X 16' deck and is going to make you feel like royalty.